Charles van Commenee: Was he crucial to UK Athletics? Charles van Commenee's decision to step down as head coach of UK Athletics might seem strange when the nation has barely stopped celebrating the four golds his squad won in the Olympic Stadium. Those who know the 54-year-old will be less surprised. Having set a medal target of eight for the London Olympics and seen his athletes fall two short, Van Commenee has decided to abide by the same strict rules he imposed on his athletes: when you fail to reach your stated aim, you accept responsibility. Who is Charles van Commenee? Sometimes controversial, always quotable, he should nonetheless be granted a grateful valediction by the country's most important Olympic sport. Britain's track and field team certainly improved during Van Commenee's reign. From the lows of the World Championships in Helsinki in 2005 under his predecessor Dave Collins, when the GB squad returned with a sorry haul of one gold and two bronze to finish 16th in the medal table behind such track and field powerhouses as Estonia, Bahrain and Belarus, the return in London was improvement off the scale. The triumphs of Mo Farah, Jess Ennis and Greg Rutherford meant more golds were won than at any Olympics in the preceding 32 years, and in 48 years at a non-boycott Games. GB's final tally of six track and field medals might have failed to meet Van Commenee's expectations, but it was both their best since Seoul in 1988. How much credit Van Commenee can personally take for those four golds is where it gets interesting. "I'm a little surprised. Charles is a very proud man. There's only a certain amount of influence you can have on success. You cannot take all the responsibility for failure in the same way you cannot take responsibility for all the medals. "His job was to change the culture of UK athletics, which was happening, but I don't think the job was done yet. "I went to the training camp in Portugal before the Olympics. I felt Charles had become an increasingly isolated figure in a system he'd set up. "He wasn't very popular, particularly with the coaches. You don't have to be Mr Popular, but I think he found it increasingly difficult. That's maybe why he wasn't enjoying it." Ennis and Farah had limited regular contact with him, their medals forged by their own coaching and support teams at their own geographical bases - Ennis in Sheffield with Toni Minichiello, Farah with American Alberto Salazar in Oregon. One of Van Commenee's key strategies was to centralise British athletics around the performance centres at Lee Valley and Loughborough. Rutherford and 400m silver medallist Christine Ohuruogu have both benefited significantly from the facilities at the latter, while Rutherford's inspirational American coach Dan Pfaff was persuaded out of semi-retirement by Van Commenee's unique charms. How much control did the Dutchman exert over the performances of his squads? "On the day itself the athletes have to deliver," he told me earlier this year. "There's nothing you can do about that, as a coach, as a system, as a federation." There's truth in that. But Van Commenee created a culture where podium took precedence over participation, where excuses - even sometimes valid ones - were not tolerated. British athletes produced 11 personal bests in London, seven season's bests, two national records and one UK under-20 record. Under the greatest pressure imaginable, that is the definition of delivering. Not everyone came with him. His irascible, intransigent management style found less favour with established coaches and athletes than the young bucks. Some felt he took credit for the achievements of coaches with a lower public profile, while his very public rows with Phillips Idowu both overshadowed their mutual successes and failed to bring the best out of one his star performers. "I think he has done a fantastic job. 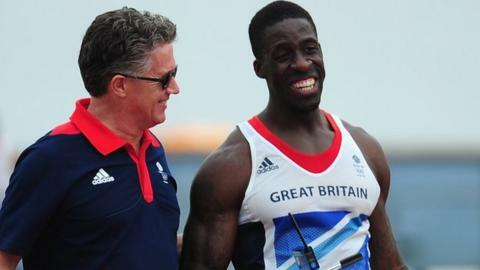 Love him or hate him he has come in and was given a remit to change the mentality of British athletics, which he has done and it's disappointing for me to hear that he has decided to step down. Fair play to him because he asked his athletes to go out there and not rely on funding without achieving success. He gave them a target which they had to achieve at the Olympics, they didn't reach that target so now he has stepped down." His work ethic and determination to succeed, however, were beyond dispute. More athletes had greater access to better support services than ever before, and fewer missed big championships because of injuries that could have been spotted or screened in advance. He also leaves the sport with a new generation of talent coming through. Underneath the headline-hogging golden deeds of Farah, Ennis and Rutherford in London the coming stars were making their presence felt: Sophie Hitchon breaking the national hammer record to make the final, Andrew Osagie going fourth on the UK all-time list in the 800m final, Lawrence Clarke finishing a brilliant fourth in the 110m hurdles. The future should also be bright for Lawrence Okoye, Andy Pozzi, Ross Murray, Holly Bleasdale, Laura Weightman and Katarina Johnson-Thompson, among others. UK Athletics are due to name Van Commenee's successor on Thursday morning. The new recruit will take office knowing that in some ways their task is an impossible one; what could ever top those three Olympic golds in 46 minutes, or Farah's 5,000m triumph in front of 80,000 screaming British fans a week later? There is a simple answer: nothing ever can. And by that the new head coach will be set free. They will also have their own home-town summit to build towards. In summer 2017 London will host the World Championships in the same Stratford stadium that witnessed the zenith of the Van Commenee era last month. It is both a challenge and a wonderful incentive.